Your orthodontist prescribed you headgear for your dental condition but you don’t want to wear unattractive, uncomfortable, and actually embarrassing orthodontic headgear. 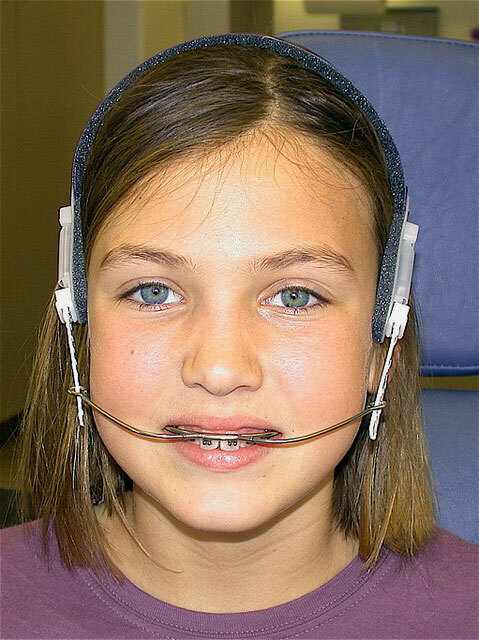 Although headgear, firstly introduced in the 1800s, is still used by the majority of orthodontists to treat overbites. But the good news is that now you have more options in addition to head gears to treat your overbite. Now a days, the most popular headgear substitute appliance is Herbst. The technique behind this appliance is that it actually to help the lower jaw grow forward. This leaves the upper jaw in its natural, healthy position, and encourages the lower jaw to align the bite. By helping the lower jaw grow forward, instead of pushing back the upper jaw with headgear, you can have a healthier, more aligned bite while keeping your airway open, which in turn decreases your risk of developing future issues with your breathing and sleep. One advantage of Herbst appliance is, how inconspicuous the Herbst is when compared to headgear. Instead of being immediately visible to every passing onlooker, the Herbst appliance is small and located inside of the mouth, only being visible when the patient opens their mouth widely. Additionally, when the Herbst appliance is used properly, it gently and comfortably encourages lower jaw growth, aligning the jaws and eliminating the overbite. This appliance is most effective during late preadolescence, when the child is experiencing the early stages of puberty. Below is a brief comparison of two different appliances which are used to correct overbites. Read to know more about these appliences. For decades, orthodontic headgear has been very important part of the treatment for patients with overbite problem. Headgear basically creates forces that guide the growth of the face and jaws. In addition to this, this appliance is used to create space for teeth, move teeth into better positions, or to prevent teeth from moving. It is a removable appliance that consists of a facebow and a strap. The facebow, which consists of a rounded metal frame, is attached to bands on the maxillary molars and is secured with a strap either around the neck or the head. Since it doesn’t attach to the lower teeth, the lower jaw can grow normally which may be favorable for some cases. Besides being unattractive, uncomfortable, and bothersome, headgear can have some undesirable side effects. For instance, being used as overbite corrector, it pushes the upper jaw and teeth backward, while also preventing the jaw from growing. This approach always assumes that the upper jaw is the source of the overbite, but in actual, majority of overbites are due to the lower jaw being too small and set too far back. So if you have a lower jaw that is set too far back, and headgear fix it by pushing the upper jaw back to match it, it can hinder the growth of the upper airway, resulting in breathing difficulties like sleep apnea. You may also feel tenderness for the first few days of wearing your headgear, but it will disappear as you adjust to the new pressures. You have to be very careful while removing your headgear, as the part that fits in your mouth and attaches to your teeth could injure your lips, cheeks, face and possibly your eyes. The Herbst appliance is not something new but not as widely used as headgear. If you use Herbst, it guarantees you a beautiful, straight, and healthy smile, but without bothering for ugly, uncomfortable headgear. Herbst Appliances are not only used to correct overbites but it also guide your jaws into the right position. Unlike headgear, the Herbst appliance is non-removable. It is usually used in conjunction with an expander on the roof of the upper jaw and has an arm that attaches to the lower teeth via a lower stabilizing bar. The function of the Herbst is to create a force that encourages growth of the mandible by advancing the lower jaw. It moves the lower jaw forward immediately giving the added benefit of an improved profile during treatment. The Herbst appliance is worn typically for a year and followed by braces for finishing the smile. This appliance is very effective in correcting large overbites especially in growing patients. 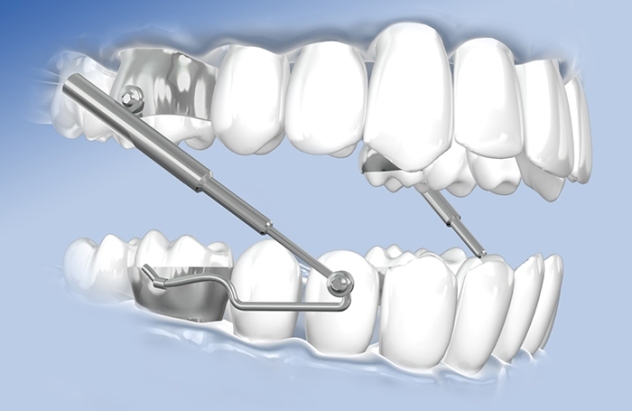 The Herbst appliance is cemented on the back teeth and worked 24/7 in your mouth.